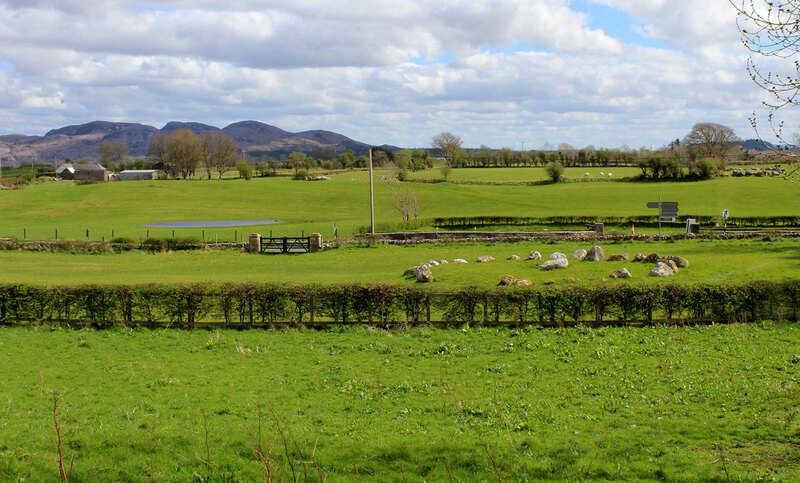 Carrowmore Circle 3, with Circles 17, 19, 59, 59 and 57 and the Sliabh Da Ean mountains beyond. from Dolmens of Ireland by William Borlase. 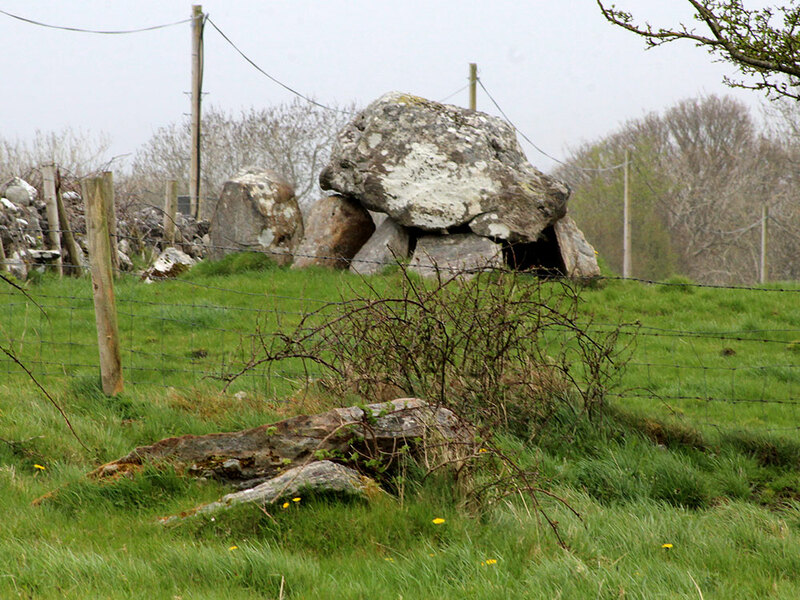 In the Townland of Carrowmore, and Parish of Killmacowen, are, or were, at least 60 dolmen-circles here indicated in Roman numerals (I - L XV) - to distinguish them from other monuments included by Petrie - 44 of which latter are indicated in Ordinance Survey Map No. I4, in a site marked Sepulcchral Stone Circles, including one (No. 13 in list) marked Druid's Altar, and the cairns of Listoghil, and Laghtareal. There were originally many more. In the same Townland is an extensive "Caltragh." Carrowmore 3 and Queen Maeve's cairn on Knocknarea. The peninsula in which the series of monuments now to be described lies was anciently called Cuil-irra. Under this latter name were included the parishes of Saint John's, Kilaspugbrone, and Kilmacowen. 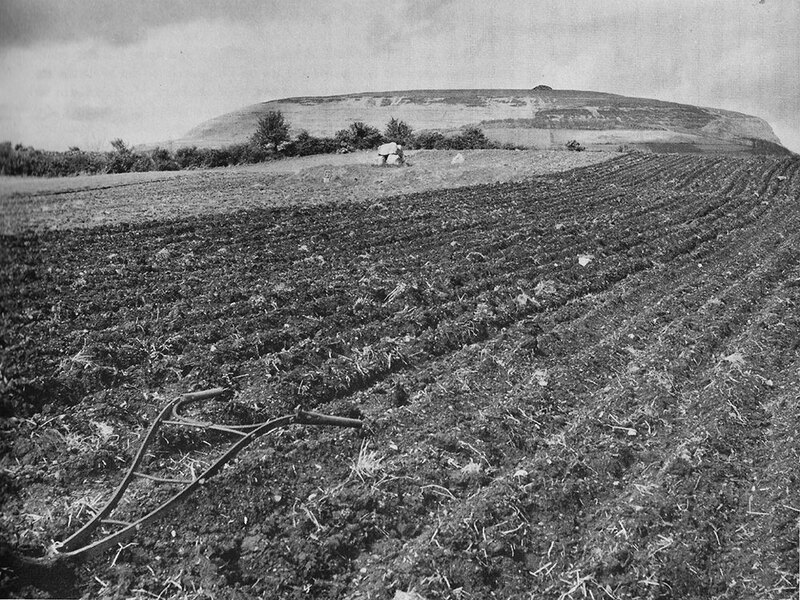 Carrowmore is traversed by the road from Seafield to Sligo. 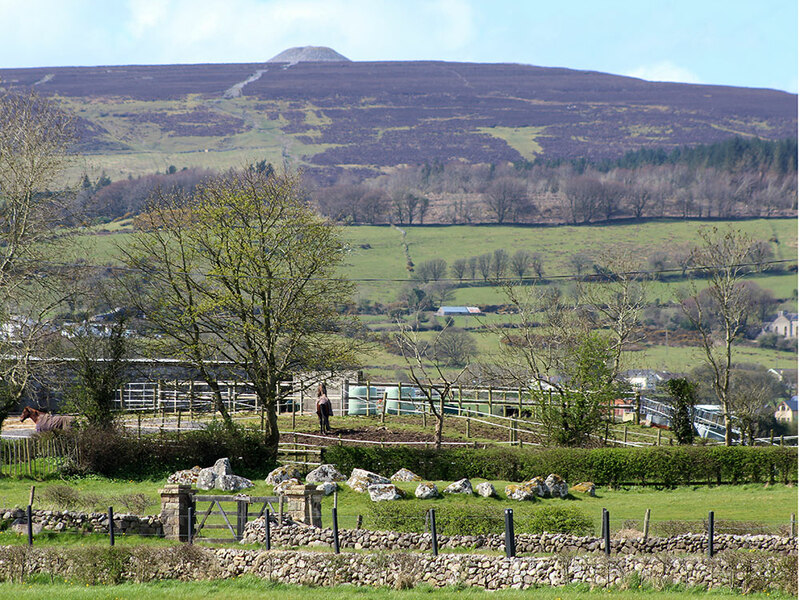 To the north, and adjacent to Carrowmore, lies the Townland of Tobernaveen, and beyond it to the northwest, on the other side of the road from Rathcarrick to Sligo, that of Barnasrahy. To the South of Carrowmore are the Townlands of Graigue on the west, and Cloverhill on the east. 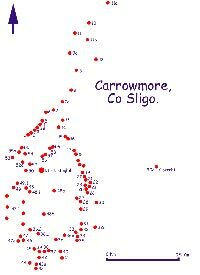 In each of these neighbouring lands some examples of the series called the "Carrowmore group" occur. Carrowmore 13 from an original sketch by Petrie. "There can be little doubt," says Col. Wood-Martin, "that the following account of the excavation of a 'tomb' by Mr. R. C. Walker, given by Sir William Wilde, relates to one of the Carrowmore series." "The centre of a large cairn was occupied by a cist or tomb, which contained the remains of a great number of skeletons, some evidently burned, and others exhibiting no traces of fire. One of the stones which formed the side of this cist was 16 feet in length, and about 6 feet in breadth. In it were found six different human interments, which occupied the east and west ends, the centre part being unoccupied. The bones were not contained in urns, but were collected together in small heaps that rested upon the free stone-flag, which invariably formed the bottom or floor of the inner tomb. Carrowmore 4 and Knocknarea. Photo by Michael Herity. Large bones, those of arms, legs, and thighs, covered the half-calcined remains of smaller bones, and the skull surmounted the little pyramids thus formed. Round the margin of each heap was collected a quantity of bones of birds, and of some of the lower mammalia, together with a number of small shells, principally of the land Helix. Each of these six interments was kept distinct, and surrounded by small freestone flags. No weapon or ornament of any kind was discovered in the tomb." "Beauties of the Boyne and Blackwater," by Sir W. Wilde, p. 234; R.S.M., pp. 17, 18.